What Are These Tools and Techniques? How Are They Used? 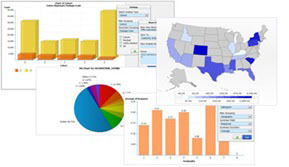 It takes powerful performance improvement and analysis tools and techniques – process analysis, data mining, data visualization, analysis, and predictive modeling – to enable us to take past events, measure current performance and project possible future outcomes. These predictions are based on patterns and interrelations between data elements unseen by using spread sheets and simple graphs. In addition, these tools enable us to study existing processes and procedures with the eventual aim of streamlining operations. Decision making is also improved when facts are known and future outcomes can be enhanced when the right choices are made and business rules are improved. Collecting the best data available, performing data analysis, and building the right models results in better understanding of customer’s behavior and their reaction to marketing programs all leading to improved performance. Identifying key financial metrics and building predictive models can also help in freeing up working capital, reducing bad loans or late payments, increasing funds recovered from fraudulent transactions, and many other financial benefits. What Does it Take to Use Business Analytics to Improve Business Results? It takes key performance metrics, a process mind set, powerful data mining tools, business analytics, and models utilizing complex algorithms to discern improvement opportunities. Determining what to measure, which models to use has become more challenging each day with the increasing abundance of data, its complexity and the growing interrelationship of departmental functions and processes. The analytical work can be also time-consuming, labor-intensive, highly technical, and expensive in terms of purchased software and dedicated staff. What if you don’t have the time or money to develop this expertise and build an analytical environment inside your organization? ACG has the answer. ACG Offers an Opportunity to be Analytical without the Expense and Hassle!! ACG eliminates all these concerns by taking over the labor and technical aspects of the job. We perform all of the process reviews, analysis, designing, model building (many process maps and models have been built for other clients – reducing further cost of development), testing and implementation. Unlike other performance and modeling shops, we have the business process re-design, change management and operational expertise to make sure the solution is the best and can be successfully implemented in your environment. Unlike other service providers, we do not have a software or hardware solution to sell you. We have no compensation arrangement with any software vendor nor do we come in with a preconceived notion of what is needed. We do have relationships with a select group of Alliances that we feel are best-in-class in their chosen areas of expertise and who work effectively with ACG. Having these relationships does not preclude us from using other resources. We are dedicated to bring the most cost-effective solution to our customers, no matter the source.